President elect Donald Trump has ordered the Pentagon and the State Department to develop plans for so-called safe zones in Syria. Trump says the order will protect civilians and prevent refugees from flooding into Europe and America. In doing so, Trump has aligned himself with Bush-era neocons, including senators John McCain and Lindsey Graham, who have called for no-fly zones as part of an effort to overthrow Syrian president Bashar al-Assad and ultimately realize the Pentagon plan to establish an Islamic principality and balkanize the country. To Crush ISIS, Will Trump Send U.S. Troops Into Syria? Complete loss of Arctic sea ice & snow cover year-round. Country-sized glaciers from Greenland & Antarctica crashing into the oceans causing massive tsunamis & raising sea-levels by at least 10 feet by 2050 & 25 feet by 2070. Reversal of wind & water flows at the North Pole Ocean. Huge storms. More often. Lasting longer. Crop failures & global mayhem. Trump's Travel Ban: Targeting Terrorism...Or Iran? You will often see potentially important pieces of legislation languish in the US House. A bill will remain active, meaning that it can be brought to the Floor at any time. But it flies just under the radar. Other times the language floats around Washington for years until a “crisis” necessitates its activation and passage. As we know well, what eventually became the PATRIOT Act – one of the single greatest attacks on civil liberties in US history – started out and spent much of its early life as a sugar-plumb fairy dancing in neocon fantasies. Then came 9/11 and it was dusted off and imposed on the American people. And the United States has never been – and may never be – the same. Either way, these measures are important if seldom seen. So it may well be with H.J.Res. 10, introduced in the House just as the new Congress began at the beginning of this month. The title of the bill tells the tale: a bill “To authorize the use of the United States Armed Forces to achieve the goal of preventing Iran from obtaining nuclear weapons.” This legislation, introduced by Rep. Alcee Hastings (D-FL), is as it appears: an authorization for the President to use military force against Iran. But it is much worse than that. Why so? 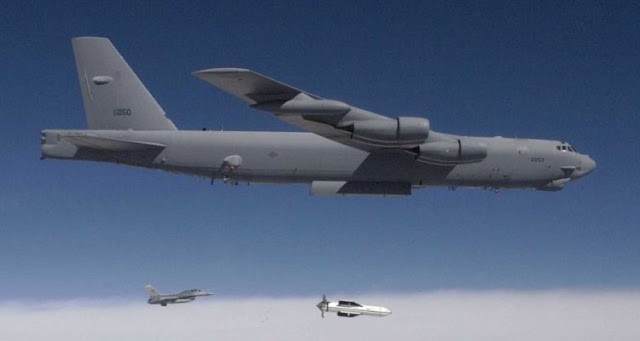 Because it specifically authorizes the president to launch a pre-emptive war on Iran at any time of his choosing and without any further Congressional oversight or input. The operative sentence in the resolution reads, “The President is authorized to use the Armed Forces of the United States as the President determines necessary and appropriate in order to achieve the goal of preventingIran from obtaining nuclear weapons.” (Emphasis dded). President Trump – and, importantly, his entire national security team – has been extraordinarily aggressive toward Iran, repeatedly threatening that country both at the negotiating table and on the battlefield. H.J.Res 10 would be just the blank check the Administration craves to realize such threats. Daniel McAdams is director of the The Ron Paul Institute for Peace & Prosperity. Reprinted from The Ron Paul Institute for Peace & Prosperity. Earnest says Pres Obama wants to afford his successor the same customs and courtesies he received from Pres GWBush - staying on sidelines. ... and in his first public statement, the former president the charge that the Trump administration had based his immigration executive order on a policy adopted by his own administration, and endorsed the protests that have been taking place across the country in response to the new restrictions. Kevin Lewis, Obama's spokesman, said rejected Trump's insistence that the decision to temporarily halt refugees from seven Muslim-majority countries and stop all Syrian refugee resettlement in America is similar to a 2011 decision by Obama. "With regard to comparisons to President Obama’s foreign policy decisions, as we’ve heard before, the President fundamentally disagrees with the notion of discriminating against individuals because of their faith or religion." As a reminder, over the past 24 hours, Trump has compared his actions to Obama's 2011 moves to restrict entries from Iraq after two Iraqis were arrested in Kentucky on terrorism charges. Former Obama administration officials have denied that there was ever a halt to the awarding of visas to Iraqis, though the processing of these applications slowed after they were subject to more intense scrutiny. Obama's decision to step back into the public light comes just 10 days after he left office. He joins the chorus of Democrats and mostly tech CEOs criticizing Trump for his decision to temporarily halt refugees from seven Muslim-majority countries and stop all Syrian refugee resettlement in America. "President Obama is heartened by the level of engagement taking place in communities around the country. In his final official speech as President, he spoke about the important role of citizen and how all Americans have a responsibility to be the guardians of our democracy--not just during an election but every day," Lewis said. "Citizens exercising their Constitutional right to assemble, organize and have their voices heard by their elected officials is exactly what we expect to see when American values are at stake." As The Hill notes, former presidents often give their replacements a wide berth in office, rarely weighing in to criticize their actions out of respect for the office. While Obama served as a vocal critic to Trump on the campaign trail, he told reporters during a trip to Peru last November that he wanted to give Trump the chance to lead without Obama "popping off." But Obama added that he wouldn't unilaterally remain quiet, and today he held true to that loophole. “As an American citizen who cares deeply about our country, if there are issues that have less to do with the specifics of some legislative proposal or battle, but go to core questions about our values and our ideals, and if I think that it's necessary or helpful for me to defend those ideals, then I'll examine it when it comes,” Obama said. President Obama is heartened by the level of engagement taking place in communities around the country. In his final official speech as President, he spoke about the important role of citizen and how all Americans have a responsibility to be the guardians of our democracy--not just during an election but every day. With regard to comparisons to President Obama's foreign policy decisions, as we've heard before, the President fundamentally disagrees with the notion of discriminating against individuals because of their faith or religion. Inquiring minds are taking a flashback look at the Secure Fence Act of 2006, signed by president Bush. 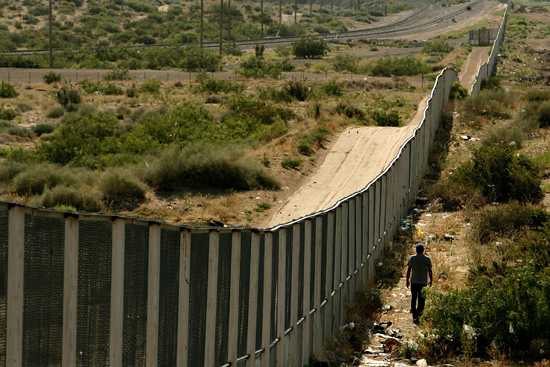 The Secure Fence Act of 2006’s goal is to help secure America’s borders to decrease illegal entry, drug trafficking, and security threats by building 700 miles (1,100 km) of physical barriers along the Mexico-United States border. Additionally, the law authorizes more vehicle barriers, checkpoints, and lighting as well as authorizes the Department of Homeland Security to increase the use of advanced technology like cameras, satellites, and unmanned aerial vehicles to reinforce infrastructure at the border. Congress approved $1.2 billion in a separate homeland security spending bill to bankroll the fence, though critics say this is $4.8 billion less than what’s likely needed to get it built. The final roll call shows both Barrack Obama and Hillary Clinton voted for the bill. In a CNN debate in Austin, Texas, Democratic presidential candidates Barack Obama and Hillary Clinton agreed Thursday night that the Secure Border Fence Act of 2006, which directs the secretary of Homeland Security to construct 700 miles of double border fencing along specific sections of the U.S.-Mexico border, should not be enforced as written. “Well, I think both Senator Obama and I voted for that as part of the immigration debate,” she started. “And having been along the border for the last week or so–in fact, last night I was at the University of Texas at Brownsville — and this is how absurd this has become under the Bush administration. Because, you know, there is a smart way to protect our borders, and there is a dumb way to protect our borders. And what I learned last night when I was there with Congressman [Solomon] Ortiz [D.-Texas] is that the University of Texas at Brownsville would have part of its campus cut off. “This is the kind of absurdity that we’re getting from this administration,” Clinton continued. “I know it because I’ve been fighting with them about the northern border. Their imposition of passports and other kinds of burdens are separating people from families, interfering with business and commerce, the movement of goods and people. So what I’ve said is that I would say, wait a minute, we need to review this. There may be places where a physical barrier is appropriate. “I think when both of us voted for this, we were voting for the possibility that where it was appropriate and made sense, it would be considered,” said Clinton. “But as with so much, the Bush administration has gone off the deep end, and they are unfortunately coming up with a plan that I think is counterproductive. When King then asked her whether she now thought her vote for the border fence was wrong, she did not give a yes-no answer. Instead, she suggested using more manpower and technology, instead of fencing, to secure the border. That has to be one of the lamest of lame reversals in history. Somehow it is counterproductive to have a fence, but not counterproductive to create a wall of people to keep immigrants out. 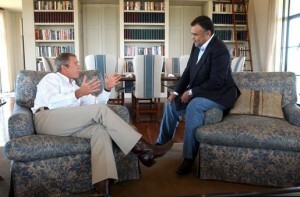 And Hillary moaned about Bush “absurdity”. Though thousands of refugees from Syria make their way to Europe every year, some have decided to return home. Spero Hadad is one of them. By leaving Saudi Arabia and other key terrorism sponsors off his “Muslim ban,” President Trump shows the same cowardice and dishonesty that infected the Bush and Obama administrations, writes Robert Parry. President Trump’s ban against letting people from seven mostly Muslim countries enter the United States looks to many like a thinly concealed bias against a religion, but it also is a troubling sign that Trump doesn’t have the nerve to challenge the false terrorism narrative demanded by Israel and Saudi Arabia. The Israeli-Saudi narrative, which is repeated endlessly inside Official Washington, is that Iran is the principal sponsor of terrorism when that dubious honor clearly falls to Saudi Arabia, Qatar and other Sunni-led Muslim states, including Pakistan, nations that did not make Trump’s list. The evidence of who is funding and supporting most of the world’s terrorism is overwhelming. All major terrorist groups that have bedeviled the United States and the West over the past couple of decades – from Al Qaeda to the Taliban to Islamic State – can trace their roots back to Sunni-led countries, particularly Saudi Arabia, Pakistan and Qatar. Privately, this reality has been recognized by senior U.S. officials, including former Vice President Joe Biden, former Secretary of State Hillary Clinton and Trump’s National Security Advisor Michael Flynn. But that knowledge has failed to change U.S. policy, which caters to the oil-rich Saudis and the politically powerful Israelis. For instance, in August 2012, the U.S. Defense Intelligence Agency – then headed by General Flynn – warned that Salafists, the Muslim Brotherhood, and Al Qaeda were “the major forces driving the insurgency” against the largely secular government in Syria. 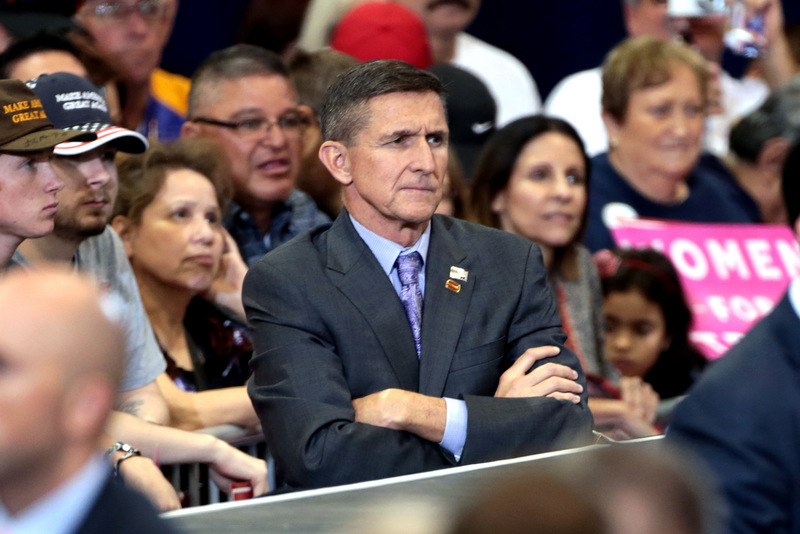 Flynn’s DIA advised President Obama that rebels were trying to establish a “Salafist principality in eastern Syria,” and that “western countries, the gulf states, and Turkey are supporting these efforts” to counter the supposed Shiite threat to the region. So the truth was known at senior levels of the Obama administration – and now via National Security Advisor Flynn at the top of the Trump administration – but the Israelis and the Saudis don’t want that reality to shape U.S. foreign policy. In other words, this truth about the real source of terrorism was known but unknown. Instead, Israel demands that Washington share its hatred of the Lebanese militant group, Hezbollah, a Shiite force that organized in the 1980s to drive the invading Israeli army out of southern Lebanon. Because Hezbollah dealt a rare defeat to the Israeli Defense Force, Israel puts it at the top of “terrorist” organizations. And, Hezbollah is supported by Iran. Saudi Arabia, too, hates Iran because the Sunni-fundamentalist Saudi monarchy considers Shia Islam heretical, a sectarian conflict that dates back to the Seventh Century. So, the Saudi government has viewed Sunni jihadists as the tip of the spear against these Shiite rivals. Israeli and Saudi officials have even made clear that they would prefer Al Qaeda or Islamic State to prevail in the Syrian war rather than have the largely secular government of President Bashar al-Assad survive because they see his regime as part of a “Shiite crescent” reaching from Tehran through Damascus to the Hezbollah neighborhoods of Beirut. In September 2013, Israel’s Ambassador to the United States Michael Oren, a close adviser to Israeli Prime Minister Benjamin Netanyahu, told the Jerusalem Post that Israel favored the Sunni extremists over Assad. “The greatest danger to Israel is by the strategic arc that extends from Tehran, to Damascus to Beirut. And we saw the Assad regime as the keystone in that arc,” Oren said in the interview. “We always wanted Bashar Assad to go, we always preferred the bad guys who weren’t backed by Iran to the bad guys who were backed by Iran.” He said this was the case even if the “bad guys” were affiliated with Al Qaeda. And, in June 2014, speaking as a former ambassador at an Aspen Institute conference, Oren expanded on his position, saying Israel would even prefer a victory by the brutal Islamic State over continuation of the Iranian-backed Assad in Syria. “From Israel’s perspective, if there’s got to be an evil that’s got to prevail, let the Sunni evil prevail,” Oren said. However, when Americans and Europeans worry about terrorism, they are talking about Al Qaeda and Islamic State, terror groups led by Sunni extremists. Those are the groups that have been responsible for bloody attacks on the United States and Western Europe. The absurdity of Trump’s immigration ban is underscored by the fact that it would not have kept out the 15 Saudi hijackers dispatched by Al Qaeda to carry out the 9/11 attacks. They came from the home country of Al Qaeda’s Saudi founder Osama bin Laden. Neither would Trump’s ban have stopped Muhamed Atta, one of the 9/11 ringleaders who was from Egypt, another country ignored by Trump, which also happens to be the original home of Ayman al-Zawahiri, Al Qaeda’s current leader. So, what Trump’s initial foray into the complex issue of terrorism has revealed is that he is unwilling to take on the real nexus of terrorism, just as Presidents George W. Bush and Barack Obama shied away from a clash with Israel, Saudi Arabia and the Gulf sheikdoms. In the first week of Donald Trump’s presidency, the regional interests of Israel and Saudi Arabia have continued to dictate how Official Washington addresses terrorism. Trump’s seven-nation list includes Iran, Syria and Sudan as state sponsors of terrorism and Iraq, Yemen, Somalia and Libya as countries where there has been terrorist activity. But the governments of Iran and Syria arguably have become two of the leading fighters against the terrorist groups of most concern to the U.S. and European populations. Iran is aiding both Syria and Iraq in their conflicts with Al Qaeda and Islamic State. Inside Syria, the Syrian army has borne the brunt of that fighting against terror groups funded and armed by Saudi Arabia, Qatar, Turkey, and – yes – at least indirectly, the United States. Yet while none of the Al Qaeda/Islamic State benefactors made Trump’s list, Iran and Syria did. In other words, not only is Trump’s ban a blunderbuss blast at thousands of innocent Muslims who have no intention of hurting the United States but it doesn’t even take aim at the most dangerous targets which represent a genuine terrorist threat. 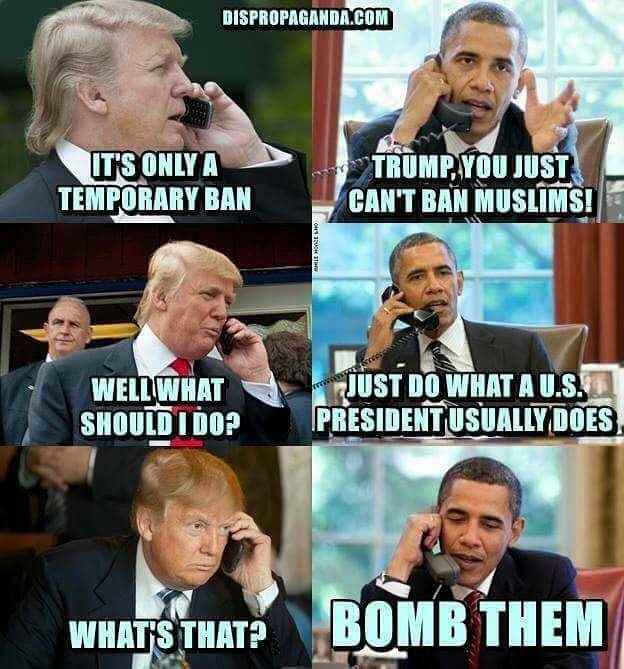 Trump’s ban is really a twisted case of “political correctness” purporting to reject “political correctness.” While Trump claims to recognize that it is dangerously naïve to let in Muslims when Islamic terrorism has remained a threat to Americans, Trump has left off his list the most likely sources of terrorists because – to do otherwise – would have negative political consequences in Official Washington. By going after Iran and Syria, in particular, Trump appears to be currying favor with neoconservatives and liberal hawks in Congress and across Official Washington. Perhaps, he is simply hesitating while the Senate considers confirmation of his choice for Secretary of State, Rex Tillerson. The Senate also could reject other of his foreign policy nominees. But that is exactly the kind of compromising that undermined any attempts by President Obama to engineer a real change from the “war of terror” strategy of George W. Bush. Obama was so afraid of going against the Israelis and the Saudis that he only altered U.S. policy on the margins and let himself get dragged into Israeli-Saudi-favored “regime change” adventures in Syria and Yemen. When Trump initially rebuffed the neocons and liberal hawks who dominate Official Washington’s foreign establishment, there was hope that he might at least try to hold Saudi Arabia accountable as the chief sponsor of terrorism, rather than to continue the Israeli-Saudi-imposed narrative. 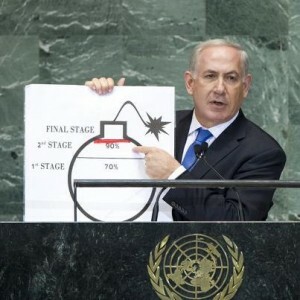 Israeli Prime Minister Benjamin Netanyahu at the United Nations in 2012, drawing his own “red line” on how far he will let Iran go in refining nuclear fuel. But to do so carried political risks beyond offending the politically potent Israelis who have forged a quiet alliance with the wealthy Saudis. Trump would also have to recognize the important role of Republican icon Ronald Reagan in creating the terrorist threat. After all, the origins of the modern jihadist movement trace back to the $1 billion-a-year collaboration between the Reagan administration and the Saudi monarchy to support the Afghan mujahedeen in their war against a secular government in Kabul backed by the Soviet Union. The extravagant arming of these Afghan fundamentalists, who were bolstered by international jihadists led by Osama bin Laden, dealt a harsh blow to the Soviet forces and ultimately led to the collapse of the secular regime in Kabul, but the victory also paved the way for the rise of the Taliban and Al Qaeda, blowback that hit the United States on 9/11. The U.S. reaction to that shock never directly addressed how the problem had originated and who the underlying culprits were. Though George W. Bush’s administration did begin by invading Afghanistan, the neoconservatives around him quickly turned the U.S. retaliation against longstanding Israeli targets, such as Iraq’s Saddam Hussein and Syria’s Assad dynasty though they had nothing to do with 9/11. Trump, who is heavily criticized for his inability to distinguish fact from fantasy, could have displayed a brave commitment to truth-telling if he had fashioned his counter-terrorism policy to actually address the real sponsors of terrorism. Instead, he chose to continue the lies that the Israelis and Saudis insist that Official Washington tell. In doing so, Trump is not only offending much of the world and alienating countries that are at the forefront of the fight against the worst terrorist threats, but he is continuing to shield the key regimes that have perpetuated the scourge of terrorism. Widespread civil unrest coming to the US? Jimmy Dore breaks down Trump's "Muslim ban"
Is Donald Trump a modern day anti-hero? Are we headed for another el-Nino in 2017?